The iConverter OC3FF managed media converter provides multimode to single-mode and dual fiber to single fiber conversion, and is a cost-effective solution for extending fiber network distances. Supports multimode and single-mode dual fiber with ST and SC connectors; and single-mode single-fiber with SC connectors. 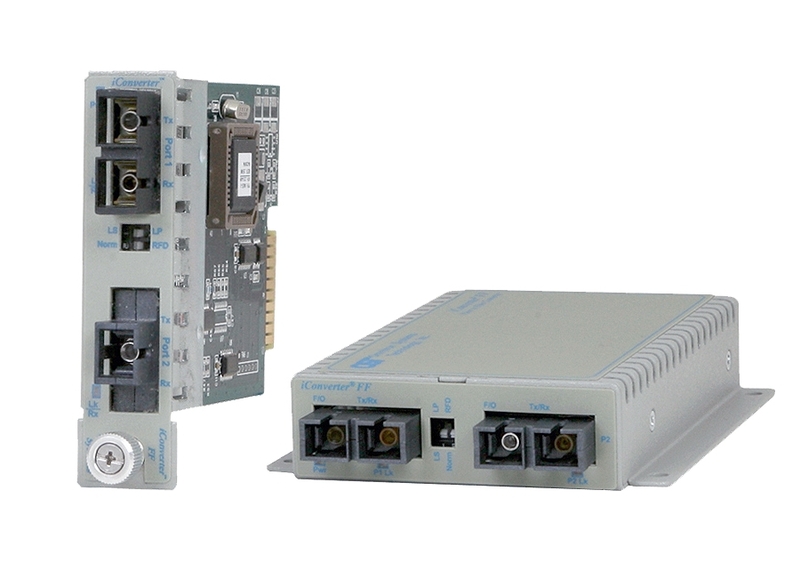 The iConverter OC3FF is an OC-3/STM-1 fiber-to-fiber media converter available as a compact, unmanaged standalone unit or a managed chassis plug-in module. The iConverter OC3FF provides a cost-effective solution to extend fiber network distances with multimode to single-mode, dual fiber to singlefiber, and wavelength (1310/1550) conversion. iConverter OC3FF models support multimode and single-mode dual fiber with ST and SC connectors; and single-mode singlefiber with SC connectors. The multimode fiber port supports ST or SC connectors and distances up to 5km. The single-mode fiber port supports ST or SC connectors and distances up to 120km. User-selectable Link Propagate and Remote Fault Detection modes facilitate quick fault detection, isolation and reporting. The hot-swappable plug-in module can be mounted in a high-density 19 or 5-Module chassis with redundant AC and DC power supplies. It can also be mounted in a 2-Module AC or DC powered chassis, or in a 1-Module chassis with AC or DC power input. The standalone OC3FF can be wall-mounted and is DC powered. It can be ordered with an external AC to DC power adapter, or it can be DC powered using a 2-pin terminal connector. The iConverter Multi-Service Platform consists of Network Interface Devices, T1/E1 multiplexers, CWDM multiplexers and managed media converters that combine to deliver Carrier Ethernet and TDM services over fiber or CWDM wavelengths. This flexible architecture supports a wide variety of configurations for scalable and reliable fiber connectivity in Service Provider and Enterprise networks. When fiber rings must extend beyond the standard 1310nm wavelength capability, a longer wavelength with increased optical power can extend SONET ring distances. The iConverter OC3FF fiber-to-fiber media converter is an inexpensive and reliable solution, especially when compared to upgrading SONET node equipment. The OC3FF provides wavelength conversion from 1310nm to 1550nm, and amplifies the optical power to span the distance in longer ringsegments. The iConverter OC3FF plug-in module can be used in managed or unmanaged applications. Management provides remote configuration, monitoring and trap notification. Management of the OC3FF plug-in module is accomplished by installing an iConverter Management Module (NMM2) or Network Interface Device (NID) in the same chassis. The Management Module can be accessed via SNMP, Telnet, and serial port. The OC3FF can be managed with Omnitron’s intuitive, graphic-oriented NetOutlook SNMP Management Software or third party SNMP management software. Management via the Telnet and the serial interfaces have an easy-to-use, menu-driven interface. The management software can override the physical DIPswitch settings such as link modes. Some of the real-time OC3FF parameters that can be monitored include power, link, data activity status, module type and model, hardware and software revisions, serial numbers and a user-defined identifier. The iConverter OC3FF supports SNMP trap notification for the monitoring and notification of different network events. Specific events that generate traps include module insertion and removal, and port link-up and link-down. Trap monitoring of specific events can be selectively enabled or disabled by the network management software. W: 0.85" x D: 4.5" x H: 2.8"
W: 3.8" x D: 4.8" x H: 1.0"
Click on a model number below to buy online in the USA. 1When using single-fiber (SF) media converter models, the Tx wavelength on one end has to match the Rx wavelength on the other. For wide temperature (-40 to 60°C), add a "W" to the end of the model number. Contact Omnitron for other configurations, extended temperature (-40 to 75°C) and RoHS (5/6) compliant models. Use the Power Calculator to determine the iConverter chassis power supplies required for your module configuration.